Greeneville Town Hall is located at 200 North College Street, Greeneville, TN 37743; phone: 423-639-7105. Photo: Andrew Johnson House, ca. 1830, Main Street at Depot Street, Greeneville, TN. Home of Andrew Johnson, 17th U.S. President, who lived here from 1851-1875. Listed on the National Register of Historic Places in 1966. Photographed by User:Brian Stansberry (own work), 2008, [cc-by-3.0 (creativecommons.org/licenses/by/3.0)], via Wikimedia Commons, accessed October, 2013. Greeneville, seat of Greene County, was named, as was the county, for Nathanael Greene, the Revolutionary War general. Surrounded by a rich agricultural region noted for its burley tobacco, Greeneville is now, and always has been, primarily a farmers' trade center. On Saturday farm families flock into Greeneville. Cars, trucks and mule-team wagons are parked everywhere; people fill the streets and trade is brisk in the stores. On a hill at the corner of Main and College Streets is the courthouse, its marker-dotted lawn a favorite gathering place. To the west along Main Street are fine houses; toward the east is the business section; southward stretch stockyards, creameries, poultry house, coalyards and the largest of all, the warehouses in which from two to three million dollars worth of tobacco is sold annually. 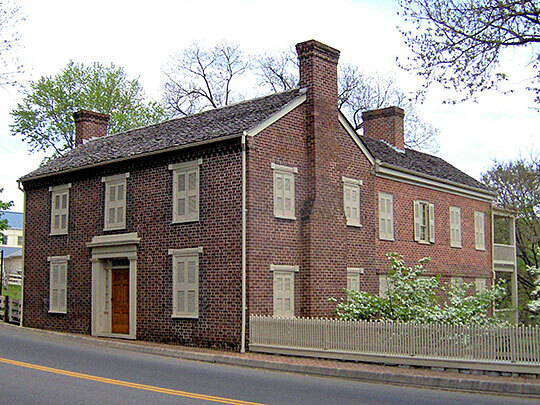 Greeneville was the capital of the State of Franklin during the last two years of its existence [1785-1787]. Greeneville College, founded by Hezekiah Balch and chartered in 1794 by the Territorial Assembly, was merged in 1868 with Tusculum College. The first paper published here was the abolitionist Genius of Universal Emancipation, edited by Benjamin Lundy, which was a successor to the paper published by Embree at Jonesboro. The Greeneville Sun, a daily paper and the Burley Bulletin, a monthly tobacco journal, are the present publications. In 1861, when the Tennessee Legislature adopted the Ordinance of Secession, the loyalists of East Tennessee held a convention here, during which they proposed that East Tennessee be made a separate State. At the age of 17, Andrew Johnson [1808-1875] — future Tennessee Governor, Tennessee Senator, U.S. Vice President and 17th U.S. President — moved here from North Carolina with his mother and stepfather. Within a few weeks young Johnson, who was a tailor, had made most of the cloth in town into suits. He moved on to Rutledge, but he stayed there only about 6 months. Hearing that the only tailor in Greeneville had left, he came back here and soon afterward, on May 17, 1827, married Miss Eliza McCardle who taught him to write and cipher. He entered politics and in 1829 was elected as an alderman on the Democratic ticket.